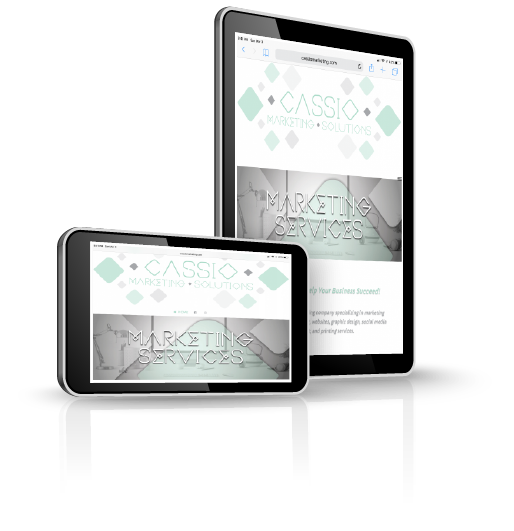 Cassio Marketing Solutions | Your Marketing Services Provider! We are a full service marketing company specializing in marketing solutions, company branding, websites, graphic design, social media management, and printing services. "Template" is Not a Word We Believe In! With 20+ years in the industry, we leverage our experience and knowledge to deliver you a superior product. Let us create a vision that is truly unique to you and your needs! Tired of being boxed in with "cookie cutter" marketing? At Cassio Marketing Solutions, we customize our marketing programs to work for YOU! "Template" is not a word we believe in - we treat every job as a brand new idea. Our branding services always deliver unique and original design concepts that make your company stand out from the rest. We always say, "the day you're finished updating your website, is the day you go out of business!". Don't be one of the 46% of businesses listed on Google that have incorrect information. We can help! Like each individual person, your business and your industry are uniquely different. We work with you to make sure you stand out from your competition with amazing graphic design work. Grow your brand online! We offer month-to-month and yearly programs to build your digital client base. Facebook, Instagram, Twitter, YouTube, Pinterest, Snapchat, LinkedIn, Houzz, and more! Digital or offset? Short run or large format? Not sure where to start when it comes to printing your marketing collateral? We do! Let us bring your marketing materials to life! "Working with Katelyn at Cassio Marketing Solutions was truly a pleasure. When starting a new business I was overwhelmed with all of the things that I needed to do in order to get the business up and running. Creating a logo and designing business cards and letterhead was one of these tasks. I am very grateful that I hired Katelyn to assist me. She listened to exactly what I wanted and she worked quickly to send me logo ideas that she created specifically for my business. The process was very easy. I highly recommend Katelyn and Cassio Marketing Solutions!" Loyal Client of 20+ Years! "Katelyn (with Cassio Marketing Solutions) is simply amazing with her uncanny ability to see what you don't and truly create a design that is uniquely YOU! We have used Katelyn for 3 of our businesses and continue to seek her assistance as our businesses grow and prosper." "Creative...Current...Flexible... Great words to describe Katelyn's talent and ease of our working collaboration. She made creating marketing for my business an easy process." "HUGE shout-out to Cassio Marketing Solutions for helping us with our wedding Save the Dates and Invites!!! Katelyn so perfectly captured our vision and color scheme while making the whole experience very personal. The communication and customer service was beyond friendly and accommodating. In a sometimes backwards industry, Cassio Marketing Solutions made us feel like we had a vendor we could trust and had our best interest at heart. We highly recommend Katelyn/Cassio Marketing Solutions and would work with her again in a heartbeat. We can't thank you enough!!!"